The complete giving platform built for churches and ministries. You get mobile, text, online, kiosk and offline giving all-in-one! A beautiful custom church app built to inspire, engage and connect your audience with God and one another all week long. Create and manage church or ministry events that make online registration easy and payment delightful. Build a healthy church with our all-inclusive church management software. It’s never too early to prepare for Easter! Not only should you expect visitors, but, most importantly, you will be celebrating the resurrection of Jesus Christ. To help alleviate your stress, here are six things you need to do to get ready. Want to grow your church? 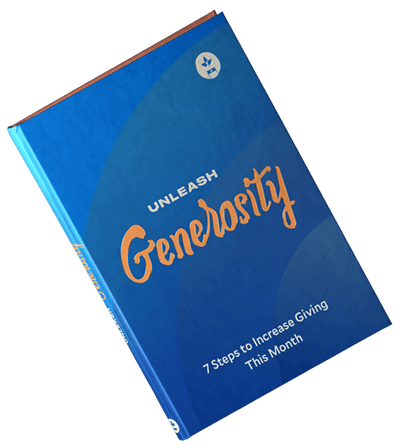 Subscribe and get a copy of our book "Unleash Generosity"
Join over 17,000 church leaders receiving our content weekly. Easter is roughly three months away, so it might feel like January is too early to start preparing—especially since Christmas just ended. But, before you know it, Easter will be upon you, and you’ll feel like you’re way behind getting ready. Like Christmas, you and your church should expect to welcome an influx of new people. Some of your visitors will be new, and some of your visitors will be traditional Chreasters who only attend worship services during Christmas and Easter. Not only should you expect visitors, but, most importantly, you will be celebrating the resurrection of Jesus Christ. So, this is an ideal opportunity for you to share the gospel and invite people to respond in faith to Jesus. Now, switching gears back to planning for Easter, we understand it can feel like a heavy burden when you think about EVERYTHING that needs to get done. To help alleviate your stress and to prepare for Easter, here are six things you need to do. Do you have a member of your staff who can oversee Easter preparations? Is there a member of your church who can volunteer to take the lead? As a church leader, your primary focus is on preaching the gospel, teaching the Bible, discipling the members of your church, and equipping leaders. When preparing for Easter, administrative tasks can quickly occupy a significant portion of your time. So, you need to be prepared to delegate responsibilities and continue to focus on what only you can do. The second thing you (or a member of your staff or volunteer) need to do is to create a plan. For your plan, first, write down your vision and objectives. How do you envision Easter at your church? Will you reach out to your community beforehand? Do you need to create a communication strategy? After you get everything out of your head and write it down on paper, you will begin to feel a release of pressure since you don’t have to think about everything. Easter is an ideal time to reach people with the gospel, and it’s also a time people like to spend with their family. You can balance both of these good desires by holding a brief family-friendly service. To accommodate the needs of visitors and the members of your church, consider running a short worship service and allow children to participate with their parents (but think about providing nursery care for children two-years-old or younger). Challenge the members of your church to invite their neighbors and friends. Provide them with resources they can use to invite someone else, such as an invitation card easily. You can also create social media graphics and content the members of your church can use to share online with their network. Your church’s website is the new front door. Most people will visit your church’s website way before they consider visiting your physical location. So, before Easter, you will want to make plans to prepare your website to lead visitors to your physical front door. From making your website easy to use and creating great first impressions, there are several practical things you can do ahead of time. One of them may even be to ensure it's very easy for people to find your online giving page! Finally, plan on getting visitor information and following up with them after Easter. You will want to make sure you have information cards available, that you encourage people to provide their information, and even consider offering a gift for visitors, which will give you an opportunity to talk to people face-to-face. How does your church prepare for Easter? Share your experience in the comments below. If you don’t know how to create a church budget, it doesn’t matter how much money you have. Your church will fail. Use this line-by-line model to safeguard your church's long-term financial wellbeing. Download a FREE sermon series on generosity. There are four specific questions every compelling story answers. Here are five trends in church tech to keep an eye out for this year. No one models generous leadership better than Boaz, the spiritual leader who became Ruth's husband. Creating a worship set every week is hard. Selecting the right songs can feel like a painstaking experience. Here's 6 must-ask questions to help you get ready. Why Do Churches Fail in the First Four Years? Pastor, feel overwhelmed by the number of apps and services online? Not sure what to use? Check out these list of 15 must-use apps and toos. Looking for Thanksgiving sermon inspiriation? Check out these 6 sermons. They just might make you ... thankful. From his book "Garden City," John Comer shares how our view of eternity transforms the way we work today. Considering whether or not to buy a building for your church? From the "Life-Giving Leader," Tyler Reagin talks about counterfeit wins, and how your church or organization need to uncloak them to create a healthy culture. Looking for a new pastor? Find out more from your pastoral candidates by hearing their response to these top questions. If you’re a church administrator, here are five church management tips to help you get started or improve on how you’re serving your church. Jason Young and Jonathan Malm, authors of "The Come Back Effect," share the one thing that will alter your church's culture for better or worse. Matt Perman debunks 6 common productivity myths holding you back. Peter Greer and Chris Horst share 6 ways you can become a collaborative leader from their book "Rooting for Rivals." Seasoned pastor? Young preacher? Here's a simple step-by-stepy guide on how to write a sermon. Church technology provides four unparalleled opportunities in history for your church to reach people with the gospel and disciple your congregation. Nils Smith has had the opportunity to manage many church websites. Here are a few Church Website Myths he's heard about over the years. While it may be unavoidable all together, there are ways your church can break out of the summer giving slump. Here are the most common barriers to adopting technology you’ll come up against in your church. Discover the five simple daily practices John Maxwell follows to become a better servant leader. Do you feel alone in your ministry? As a pastor, there’s a deep sense of camaraderie you can build with other pastors who can relate with you in the highs and lows. As a pastoral candidate, these six questions will provide information you need in your interview to make the best decision. Gleaning wisdom is essential to exercise patience, trust the Lord, and, select the right position. Set your goals and guide your church leaders to inspire and equip. Setting the right goals provides vison, inspiration, and direction. Are you thinking through ways to help your church spiritually respond to the GOP Tax Bill? These four principals may help you focus your church spiritually. The Church was created by God to help people live out their Christian lives. Discipleship, training, equiping, community and much more come from being in the Church. Many churches struggle with organizing a worship service that is welcoming to first-time guests and evangelistic while faithfully sharing the gospel and holding onto your church’s traditions. Leading your church through a cultural shift is a long-term process. Here are four ideas to help your leadership work well as you embark on this change. Recruiting volunteers is difficult. Encouraging volunteers in their work is even more challenging. God does not call you to do everything for everyone. In many ways, volunteers are the fuel that runs your church. Are Christians Required to Tithe? How you manage your money as a Christian is important. Discouragement is no respecter of persons. It is a common adversary to every man, woman, and child (1 Cor. 10:13). But discouragement often finds a welcome home in the life of a pastor. Many churches permanently close their doors every year. As a church leader, this pivot in the way you treat fundraising and giving will completely alter your approach. From your motivation and your messaging, your goal is to make disciples and to provide opportunities for people to participate in God’s work. Here are four Christ-centered principles that you can use to lead people to be generous givers. Your pastor may give you the impression that they do not need breaks. But pastors are human. Here are 4 practical ways you can help yours get some rest! Here are five tips on getting your church to try mobile giving. Has your church experienced an increased in giving? Do you foresee your church’s giving increasing in the near future? Millennials are the largest living generation in the US. Their presence is not only changing the workplace and society, but it’s also influencing the church. Before too long, these changes will be the norm. Announcements are important for the community of your church. As a church leader, it is best to have a plan in place on how you will respond when — not if — your church experiences a decline in giving. To help you think how to respond during these times, here four questions you will need to ask. Here are seven keys to optimizing your church’s website, which will help you to reach more people with your church’s website. These tactics are equally important, so plan on taking action on everything listed below if you haven’t already. Here are seven ways you can extend the life of your sermon. Talking about money is never easy. It hits close to home for most people. Memorial Day is less than a week away. This national holiday marks the end of school and the start of summer. Do you keep track of the giving in your church? Do you know where the money your church spends is going? Most people don’t tithe. This isn’t a judgment, just an observation. Let’s walk through 11 ways you can increase your church’s giving. The steps below are listed in order in that they build off of one another. There are many tactics church leaders can use to motivate their people to give. The tactics we use may lead to short-term generosity. But tactics will not help build a generous church culture. There is only one way you can do that. Giving and data are two of the least exciting subjects in the church. Some people say that children are natural givers. But this hasn’t been our experience at home. Here are six of the most popular ways you can lead the people in your church to give. After reading through this list, take the time at the end to think through the best options for your church. In your church’s journey to the next level of size and maturity, three factors will fuel or foil your attempts. Every church of every size must evaluate each one of these three variables in order to remain healthy in the present and plan for the future. Generosity goes further than just the occassional gift to your church, or even the regular tithe. It’s a way of life that Jesus has called us to live. Growth brings change. Period. That’s true for a big company or a small church, and it’s true for people, families, corporations, and countries. If you want to function well at the next level, reinvention is absolutely necessary. As we are left in the aftermath of a long and divisive election, what do we want to be known for?